My first building on MG Road was a joint venture with the lady on whose property I had a billboard. Nitesh Broadway, a commercial space, cameA�up there, conforming to international architectural standards. Goa, Cochin and Chennai. Not bad for a 36-year-old whose first job was at his dada��s petrol pump on St Marks Road at age 17. And who started his business career at 19 with Rs12,000 borrowed from his mother. The Nitesh story has never been predictable. Along with his mega successes, there were talks about financial crunches, deals gone south, delayed constructions and disgruntled folks who cancelled bookings in the wake of one of the worst global economic downturns in recent times. Promised investment was often held up and employees had to cope with pay cuts and market uncertainties along the way. But with the successful launch of the first Ritz Carlton in India, even sceptics seem suitably impressed. a�?He has grown too big, too fast. The domestic economy is in a flux, business is stagnant and everyone is hoping for post election changes. It remains to be seen how he manages his cash flow and his timelines in the coming months,a�? says realtor and old -time Bangalorean, Ramesh Sadhwani, nonetheless adding, a�?Every prime road in town today has a Nitesh property on it. Clearly a testament to his negotiation skills, planning and track record. Word has it, Nitesh Park Avenue, designed by American firm Kohn Pedersen Fox, is pegged to be one of the finest buildings in India, not just Bangalore.a�? Shetty is reputedly quite the driven, serial entrepreneur with an unforgiving eye for detail. And despite his easy, affable charm, you can see the steely determination that has fuelled his success in the way his staff snap to attention and the energy he generates in a room as he enters. a�?We were the first to win Indiaa��s largest corporate housing project (ITC Limited) and among the first few to attract FDI in real estate from global names like Och Ziff, a US-based hedge fund, and Citigroup (property investors). We also brought the first Ritz into the country,a�? he tells us. While his is not a rags- to-riches story, since he came from an upper-middle class family, his business model, plans and strategies are purely self-driven. a�?Growing up, it was a big treat to step into a five-star hotel. Ita��s kind of unreal to think I own a luxury hotel like The Ritz now.a�? he says candidly. But why billboards to begin with ? a�?I was travelling to Malaysia in 1997 for tennis and billboards caught my attention. Although I trained to be a professional tennis player along with my best pal Mahesh (Bhupathi), I knew that I needed to change lanes and get into business. I returned home, studied the scalability, borrowed `12,000 from my mum and launched my billboard company Serve and Volley. We have 10 offices across India, covering everything from LED displays to gigantic hoardings. I also egged Mahesh on to open his company Global Sports a�� now a highly successful sports management firm.a�? Moving into real estate development was the next big step. But banks were quick to dismiss a young businessman with big dreams and little money until Dhanalakshmi Bank and Corporation Bank stepped up to fund his project. a�?My first building on MG Road was a joint venture with the lady on whose property I had a billboard. Nitesh Broadway, a commercial space, came up there, conforming to international architectural standards,a�? he recalls. Today, Nitesh Estates cover every type of development a�� from malls and commercial spaces to luxury condos and mid-range housing and people in the business are keenly watching the progress of the company. a�?He has always taken big risks and they have paid off big,a�? says Ganesh Narayan, joint managing director of CKC, who learned tennis with Shetty on The Bowring Institute courts when they were kids, adding, a�?he is also a workaholic, keeps to a close circle of friends, and even as a boy, knew what he wanted and quietly went after it. He was also smart enough to know when to quit playing tennis competitively and go into business for himself.a�? Pradeep Joe, head of the Realty Association of Bangalore, found Shetty a quiet lad who surprised everyone with his chutzpah by a�?bidding for projects that were way out of his league and bagging thema��. a�?While we stayed comfortably put in our businesses, he moved on to much bigger and better things,a�? he jokes ruefully. Shetty himself is not taking time off to bask in the aftermath of the gala launch of the Ritz-Carlton. Friends remark that he was back at work at 8 am after seeing his guests off, including best pal Mahesh Bhupathi and wife Lara, who had come in to toast his success along with a august gathering of A-listers . a�?People say he changed the skyline of Bangalore with billboards and buildings, but I feel he has indelibly marked the luxe hospitality scene in India with a big dollop of glamour and professionalism,a�? says friend and socialite, Shivika Singh. Successfully launching the first Ritz is definitely his biggest feat thus far. a�?I wanted either a Four Seasons or Ritz-Carlton. Since the Four Seasons was taken, I flew to Washington DC to meet Herve Humler and convinced him that Bangalore was the right location and I was the right developer to handle it. People said I was making a huge mistake. In 2009, we hit the economic downturn and hit bedrock in the middle of the property. I had to blast my way out of both,a�? he laughs. The Ritz-Carlton with its seven restaurants, 16,000 sq ft of spa luxury and upcoming rooftop bar is creating quite a buzz in town. And its stunning collection of 1,280 pieces of art, personally chosen by Shetty, in the lobbies, corridors and F&B outlets.a��from the fluid form of Cuban artist Manuel Carbonella��s sculpture of a couple entwined to the quirky bronze of Pablo Picasso by Robert St Croix, the reflective landscapes by Vietnamese artist Lim Khim Katy, bold, splashy canvases by Paresh Maity and Bose Krishnamachari and a whole series of vibrant abstracts by British-born Revati Sharma Singh, among others. 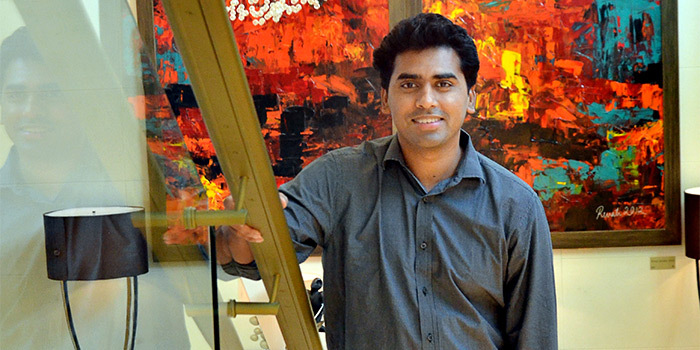 Went public at 33, becoming one of Indiaa��s youngest founder-CEOs and raised Rs500 crores. GN Bajpai a�� former chairman of SEBI. Jagdish Capoor a�� former chairman of HDFC Bank. Ashok Aram a�� CEO of Deutsche Bank Middle East. Mahesh Bhupathi a�� tennis player. Sudhakar Rao a�� former chief secretary of Karnataka. I met my wife Sujatha at a frienda��s wedding in Kumarakom. A year later, we were married. She is a brilliant research scholar who is into health-related charity projects.